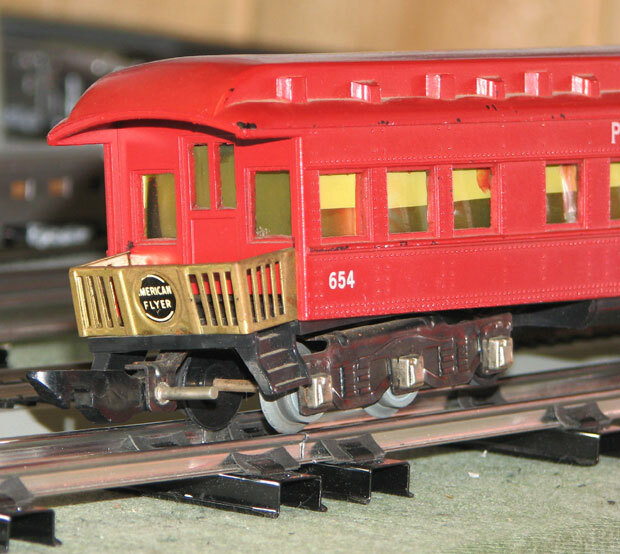 Gilbert's #4613 set, made in 1946 and 1947, had the 322 Hudson locomotive and the rare long-truck painted Pullman cars. I have the engine, but all my Pullmans are the short-truck variety. If you don't look too closely, the #4613 looks a lot like my train below. #652 coach, made in 1947 with white sans serif lettering. In 1946 they had a wider-spaced serif font in silver. This one is in quite good condition; you are more likely to find them with windows loose and paint flaking. #654 observation car, made in 1947 with white sans serif lettering. Detail of the back platform. trucks that don't hold the tracks well.